Brigadier General Mehmet Yalinalp is the Deputy Chief of Staff (Plans) for Allied Air Command. After years of operational experience piloting the F-16, he commanded 141st Advanced Tactical Training Squadron and a 4th Main Jet Base Fighter Group consisting of three squadrons. He served at different posts at several Turkish Air Force Headquarters departments including Strategy and NATO Force Planning Officer of Plans and Policy Department, Special Staff Member of Air Force ­Commander for international, military and national security issues, Planning Coordinator of Chief of Staff and Secretary General of Chief of Staff. 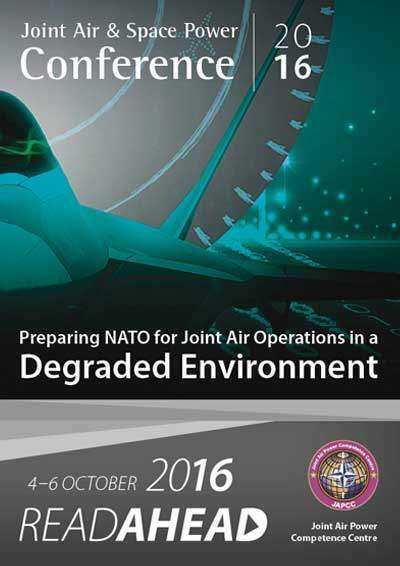 The basic paradigm for air operations in a permissive environment is evolving. The long-term enjoyed benign environment has swiftly transformed into an unpermissive, contested environment with major challenges and problems, far more problematic than have been seen in recent previous conflicts. The main cause behind these challenges and complications is the proliferation of high edge information/cyber technologies, surface- and air-launched precision-guided weapons, and advanced situational awareness capabilities. Non- ­western militaries have been continuously observing and adapting to the manner in which western militaries apply their advantages in technology, weapons, training and doctrine. In time, they have been able to adapt their policies and defences. This adaptation reveals itself in many forms; certainly the most prominent adaptation lies within Anti-Access (A2) and Area Denial (AD)spaces. The challenges in contested environments can be subdivided into two sets of complementary terms; Anti-Access and Area Denial. Anti-access environment challenges access, complicates entry and makes force posturing very difficult. Area denial environment limits movement and maneuver of our forces. Air and space power faces both challenges in contested environments. A2/AD capabilities exist in all domains of warfare (Air, Space, Maritime, Land and Cyber) and exert cross-domain challenges to all services. Adversary capabilities and different challenges arise in many forms within an A2/AD environment. One of the areas in which this difficulty arises includes the Integrated Air and Missile Defence System (IAMDS). An opponent’s well integrated and advanced IAMDS constitutes a focal adversary capability for anti-access and area denial operations. The modern IAMDS, with its highly capable and cutting edge technology and double-digit SAMs, ­presents a considerable challenge to friendly aircraft. Added dangers have arisen from evolving technology in today’s non-western fourth- and emerging fifth-generation fighters. Extended range air-to-air missiles pose a highly lethal threat as they are highly competitive against their Western peers. Additionally, evolution of the ballistic missile has resulted in a high precision, GPS guided, short to medium-range ­ballistic missile, with the ability to reach and rain into forward bases and deny force projection and posturing. Counter Space Opponent attacks in space and cyber domains could deny many of the enablers for air and space power, including satellite communi­cations, space ISR and Global Positioning System (GPS) based navigation and precision systems. Some countries have already shown that they possess capabilities to attack space targets. Anti-satellite weapons have been tested, validated and proven to be effective. These concepts extend into the realm of the electromagnetic spectrum; an essential extension of space and cyberspace domains which is also an intensely contested ­environment. The electromagnetic spectrum can be exploited by j­ammers to inhibit weapon solution/ISR collection, network-centric operations and ISR collection. Especially common today are cyber-attacks, network exploits, malware-based attacks exerted to disrupt, deny, and steal information or sometimes to take control of the friendly strategic cyber capabilities. The physical elements of cyberspace, which comprise fiber optic cables, cell towers, computers and servers, are also vulnerable to adversary attacks. As a consequence of these cyber-attacks, we may become more vulnerable than the Land domain. Thus giving adversary rockets, artillery, and short/medium-range surface-to-­surface missiles can target land forces before they can disperse from air, mari­time and surface points of debarkation, where they are most vulnerable. ­Opponent AD tactics in the Land domain may also include minefields, use of chemical ­biological and radiological agents and special operations tactics. Long-range A2/AD capabilities against naval vessels, including aircraft ­carriers, may comprise coastal or afloat antiship cruise missiles (sometimes low-observable), precision-guided ballistic missiles, and silent (diesel) ­submarines and advanced anti-ship mines. In the contest for Air Superiority, an A2/AD SAM shield prevents friendly forces from attaining air dominance or air supremacy, and makes it very difficult to obtain and, even if obtained, difficult to sustain air superiority. Long-range double-digit SAM coverage, which sometimes extends into friendly territory, gives the opponent an initial ‘status quo’ Air Superiority from the beginning. It should also be noted that in the A2AD ­environment, airborne C2 and ISR collection can be very difficult without significant risks to the high value platforms. Thus, intelligence preparation of the battle­space, persistent situational awareness and decision-making processes will suffer significantly. One of the basic outcomes of operations in an A2/AD environment is high attrition rates on friendly air forces, because fighters, bombers, ISR ­platforms and cruise missiles are extremely vulnerable to the advanced SAM systems. As fighter aircraft cannot be deployed to areas already under significant threat coverage, they will be based in the rear areas of joint area of operations. This will create a massive reliance on air-to-air refuelling ­aircraft. It must be taken into consideration that if the opponent’s territory is ­beyond a large sea or even an ocean, forward basing options will be very limited, some of the deployment/operation ports and bases might be exposed to surface-to-air, air-to-surface and surface-to-surface weapons of the opponent. Anti-Access Shield against friendly Long-Range Weapons and modern SAM systems have critical capability against long-range stand-off weapons and cruise missiles. Moreover, there will be an increase in Theater Ballistic Missile Threat (TBMT), as high precision, GPS guided, short- to ­medium-range ballistic missiles of the opponent can reach and rain into forward bases and deny force projecting and posturing. Thus, robust and persistent Theater Ballistic Missile Defence (TBMD) must be established prior to deployment of the aircraft and forces. It is also imperative to understand the consequences of degradation in space capabilities or losing space support, as this would complicate ISR operations, precision navigation and weapon solutions and space-reliant information service. In terms of the electromagnetic spectrum, it is an essential extension of space and cyberspace domains, becoming an intensely contested environment due to air, sea and ground-based high-tech jamming systems. Adversary A2/AD operations in cyberspace can range from the tactical level to the strategic level. At the tactical level, adversaries can use cyberspace to disrupt satellite ISR/information systems and data links. At the strategic level, an adversary can attempt to take control of, or exploit, friendly information systems. Increase in Force protection in a contested environment, protecting forces, units, installations and C2 nodes against infiltration, sabotage, and direct attacks will be a major concern. A major risk in the realm of the Contested Land Domain is the proliferation of precision-guided short-/medium-range ballistic missiles, long-range ­artillery and mobile rocket launchers, as they pose a major threat to ­Reception, Staging and Onward Movement (RSOM) areas, such as ports and airfields. Adversary SAM systems can limit Army aviation, including airborne ISR, airborne assault, and air drops. Contested Maritime Domain maritime power projection and command of the sea would be hampered by coastal or afloat antiship cruise missiles, precision-guided ballistic ­missiles, and silent (diesel) submarines and advanced anti-ship mines. Firstly, mission assurance rather than information assurance, including the vulnerability analysis of friendly weapons, platforms and information/­cyber systems in peacetime provides an opportunity to assess areas most susceptible to exploitation. The focus of analysis and follow on protection should be on mission assurance rather than total information assurance in the event of a cyber attack. Secondly, Dispersal, Hardening and Force Protection. Friendly forces may have to deploy to the bases which are within adversary A2/AD ­coverage. Hardening of aircraft shelters and operation centres, coupled with robust force protection against surface and air threats will increase the survivability our operational networks and assets. Thirdly, a Joint Approach. As no single service has sufficient capabilities to address all the challenges faced in contested environments, Joint concepts like Air-Sea Battle (ASB) and Joint Operational Access Concept (JOAC) are in development to overcome the difficulties of contested ­environments. Primarily, operational planning and execution should concentrate on those adversary vulnerabilities with less or no protection so that adversary centre of gravity could be reached and attacked. With this, the Protection Reduction of Reliance on Vulnerable Systems should be kept in mind. For example, employment of high-altitude, long-endurance, and stealth ISR platforms could be an alternative to vulnerable space capabilities. Aged but long practiced and widely understood deception and decoy methods should prevail again. Sometimes these methods could be the only way to gain a superior advantage against a near-peer adversary. ­Exploitation of Stealth with ISR sensors, high edge, command and control integration capabilities through state-of-the-art, high-capacity links ­systems, fifth-generation air platforms not only serve air domain but also serve and cooperate with other domains. Additionally, air, land or sea launched cruise missiles would require stealth capabilities to penetrate opponent IAMDS. Technical agility, including the protection of vital space-based platforms and cyber networks by reducing their vulnerability to attack or disruption and increasing resilience if an attack occurs. Conceptual Agility, comprising emerging C2 concepts such as ‘Centralized Command, Distributed Control and Decentralized Execution’ and ‘C2 forward’. Lastly, Virtual and Constructive training and exercises should be exploited to develop and mature concept of operations in an A2AD environment.